Here, we present a protocol to study the invasion of tumor cells into living normal tissue fragments in three dimensions. This organ culture technique is mainly applied to test potentially anti-invasive drugs in vitro. Bracke, M. E., Roman, B. I., Stevens, C. V., Mus, L. M., Parmar, V. S., De Wever, O., Mareel, M. M. Chick Heart Invasion Assay for Testing the Invasiveness of Cancer Cells and the Activity of Potentially Anti-invasive Compounds. J. Vis. Exp. (100), e52792, doi:10.3791/52792 (2015). The goal of the chick heart assay is to offer a relevant organ culture method to study tumor invasion in three dimensions. The assay can distinguish between invasive and non-invasive cells, and enables study of the effects of test compounds on tumor invasion. Cancer cells - either as aggregates or single cells - are confronted with fragments of embryonic chick heart. After organ culture in suspension for a few days or weeks the confronting cultures are fixed and embedded in paraffin for histological analysis. The three-dimensional interaction between the cancer cells and the normal tissue is then reconstructed from serial sections stained with hematoxylin-eosin or after immunohistochemical staining for epitopes in the heart tissue or the confronting cancer cells. The assay is consistent with the recent concept that cancer invasion is the result of molecular interactions between the cancer cells and their neighbouring stromal host elements (myofibroblasts, endothelial cells, extracellular matrix components, etc.). Here, this stromal environment is offered to the cancer cells as a living tissue fragment. Supporting aspects to the relevance of the assay are multiple. Invasion in the assay is in accordance with the criteria of cancer invasion: progressive occupation and replacement in time and space of the host tissue, and invasiveness and non-invasiveness in vivo of the confronting cells generally correlates with the outcome of the assay. Furthermore, the invasion pattern of cells in vivo, as defined by pathologists, is reflected in the histological images in the assay. Quantitative structure-activity relation (QSAR) analysis of the results obtained with numerous potentially anti-invasive organic congener compounds allowed the study of structure-activity relations for flavonoids and chalcones, and known anti-metastatic drugs used in the clinic (e.g., microtubule inhibitors) inhibit invasion in the assay as well. However, the assay does not take into account immunological contributions to cancer invasion. Invasion is the hallmark of malignant tumors. This activity not only leads to the destruction of surrounding tissues, but is also implicated in metastasis formation. Since cancer patients die from invasion and metastasis, and efficient anti-invasive treatments are still scarce, laboratory assays that mimic the invasion of tumor cells have been developed. The goal of the chick heart assay is to offer a relevant organ culture method to study tumor invasion in three dimensions. The assay can distinguish between invasive and non-invasive cells, and allows to study the effects of test compounds on tumor invasion. The rationale behind the use of the assay is the actual concept that tumors are ecosystems where the neoplastic cells continuously interact with their stroma (host cells and extracellular matrix), and that through these molecular interactions invasion is fine-tuned1. So, in the assay tumor cells are confronted with living embryonic chick heart fragments2, which serve not only as substrates for invasion by the tumor cells, but also as a source of different types of stromal cells and matrix elements. The chick heart contains myocytes, fibroblasts and endothelial cells, and the extracellular matrix is composed of laminin, fibronectin and different types of collagen. In this way, the three-dimensional organ culture technique covers many cellular and molecular interactions implicated in invasion of patient tumors. The main advantage of the chick heart assay is the implementation of stromal effects. This aspect is more complete than in other invasion assays in vitro that are based on tumor cell invasion into non-living gels composed of basement membrane3 or interstitial matrix4 molecules. The concept of confrontation between tumor cells and normal living host tissue as found in organ culture experimentation has been introduced by several authors including Wolff and Schneider in France5, Easty and Easty in the United Kingdom6, and Schleich in Germany7. 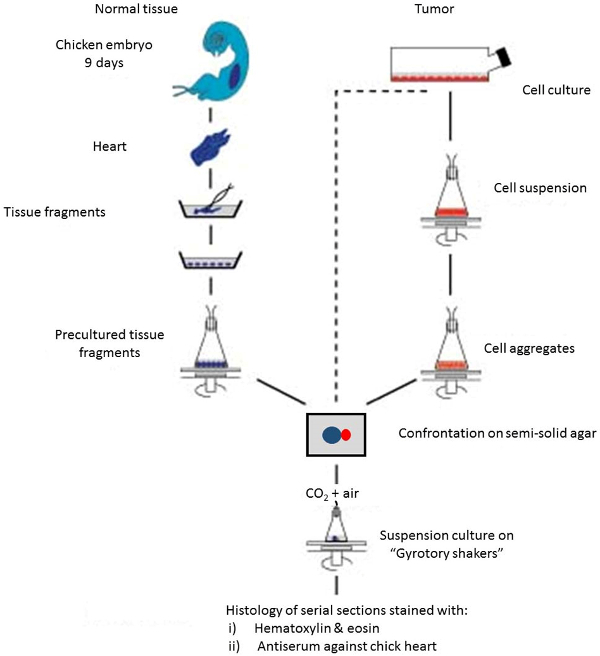 Two technical advantages of the chick heart invasion assay over the cited methods is that the volume of the fragments can easily be standardized, and that they remain contractile, which allows functional integrity monitoring during organ culture. Furthermore, avian embryos are preferred, because they can easily be dissected from the sterile content of the egg. 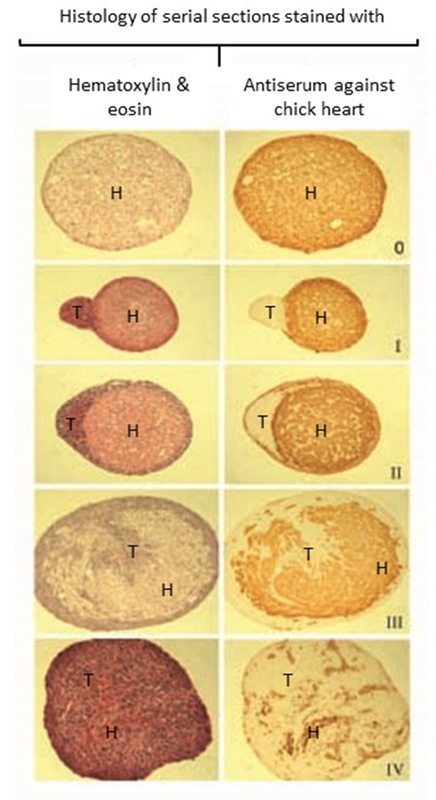 The assay has conceptual resemblance to the chick chorioallantois membrane assay8 by offering a complex stromal surrounding to the tumor cells. The assay has successfully been applied to distinguish between invasive and non-invasive cell variants from the same human tumors such as in the MCF-7 (mammary)9 and HCT-8 (colonic)10 cell line families. The technique is useful to test potentially anti-invasive compounds as well11,12. As further explained, it can be used for the establishment of structure-activity relations of small organic molecules. The assay does, however, not take into account the contribution of immunological cells to cancer invasion. It should be stressed that the technique cannot be considered as a high-throughput analysis system, because of the high number of manipulations, the limited numbers of assay runs (maximum 30 cultures) and the long turn-around time (about 1 month). Figure 1. Schematic overview of the different assay steps. Please click here to view a larger version of this figure. Incubate a fertilized chick egg at 37 °C for 9 days. Complete this incubation by a date that allows subsequent preparation of PHFs during 4 days (e.g., on a Thursday) and final confrontation with tumor cell aggregates (e.g., on the nest Monday). Disinfect the shell with 70% (v/v) ethanol in water. Carry out all further manipulations in a tissue culture cabinet using sterile solutions and materials. Open the shell at the embryonic pole using blunt forceps. Pull out the embryo by holding the neck with an enucleation spoon (Figure 2). Place the embryo in a glass Petri dish with a diameter of 5 cm containing 5 mL of Ringer’s salt solution. Open the ventral thoracic skin by ripping open the skin using a sharp forceps in both hands, remove the sternum by the same type of manipulation, and dissect out the heart using microdissection iridectomy scissors to disconnect its major blood vessels. Perform all further manipulations under a macroscope with a calibrated ocular grid. Figure 2. 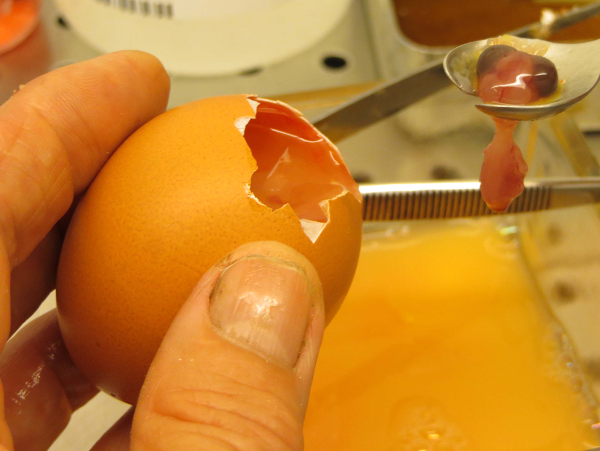 Lifting the embryo out of the egg with an enucleation spoon. Please click here to view a larger version of this figure. Transfer the heart to a glass Petri dish with a diameter of 5 cm containing 5 ml of MEM-Rega 3 culture medium with 5% fetal bovine serum. Remove the atria and associated vessels by resecting the upper cranial third of the heart using microdissection iridectomy scissors. Dissect the pericardium from the ventricles with a pair of sharp forceps. Make a sagittal hemisection in the ventricles using microdissection iridectomy scissors, and remove the blood by gently shaking with a sharp forceps. Transfer the ventricles into another glass Petri dish with a diameter of 5 cm containing 5 ml of fresh MEM-Rega 3 culture medium with 5% fetal bovine serum. Cut the ventricles into pieces of approximately 0.4 mm in diameter by using microdissection iridectomy scissors. One heart can yield about 100 fragments. Rotate the Petri dish gently to drive all ventricular fragments toward the center of the dish. Remove all corpora aliena with a stainless steel needle by separating them from the ventricular fragments and driving them towards the periphery of the Petri dish. Transfer the heart fragments with a glass Pasteur pipet to a 50 ml Erlenmeyer flask containing 2 to 3 ml of culture medium (MEM-Rega 3 plus 10% v/v fetal bovine serum). Note: The exact medium volume depends on the variable bottom convexities of the individual flasks: the centre of their bottom should be covered by a thin film of liquid only. Gas the flask(s) with a mixture of 5% CO2 in air via the stoppers, and incubate the flask(s) on a gyrotory shaker at 37 °C at 70 revolutions/min (rpm) for 24 hr. The rationale for this suspension culture step is to obtain spheroidal heart tissue fragments suitable for subsequent confrontation with tumor cell aggregates. Transfer the heart fragments and their culture medium to a Petri dish. Discard corpora aliena, necrotic (dark) fragments, and conglomerates of heart fragments with a needle. Incubate the remaining heart fragments in another 50 ml Erlenmeyer flask containing 6 ml of culture medium as described in step 1.9 for another 60 h.
Note: During this incubation period, the fragments will become spherical. They consist of a core of myoblasts and a thin layer of fibroblastic cells at the periphery. Select spheroidal fragments exhibiting a thin, homogeneous layer of fibroblastic cells (forming a translucent capsule) and a diameter of 0.4 mm by means of a macroscope and needles. One chick heart will yield about 20 suitable PHFs. Transfer these PHFs, many of which will contract rhythmically at 37 °C, to another Petri dish containing fresh culture medium. These PHFs are ready for confrontation with test cells. Prepare semi-solid agar medium: dissolve 100 mg of agar in 15 ml of Ringer’s salt solution by boiling three times. Cool the suspension to 40 °C and add 7.5 ml of Ringer’s salt solution/egg white (1:1) and 7.5 ml of fetal bovine serum. Prepare 6 ml of a suspension containing 1 × 105 test cells/ml in their appropriate culture medium in a 50 ml Erlenmeyer flask. Do this 3 days before the start of the confronting culture is planned. Incubate the flask on a gyrotory shaker at 37 °C at 70 rpm for 3 days. Gas the flasks with a mixture of 5% or 10% (v/v) CO2 in air, depending on the type of culture medium used. View the aggregates under a macroscope equipped with a calibrated ocular grid. Select (with a needle) spheroidal cell aggregates with a diameter of 0.2 mm. Use a Pasteur pipet to transfer eight selected PHFs (diameter = 0.4 mm) in a minimal amount of culture medium to an embryological watch-glass containing semisolid agar medium13. Move the individual PHFs with a needle to form a circle. Aspirate excess medium using a small piece of filter paper (see Figure 3). Figure 3. Aspiration of excess fluid around PHFs. 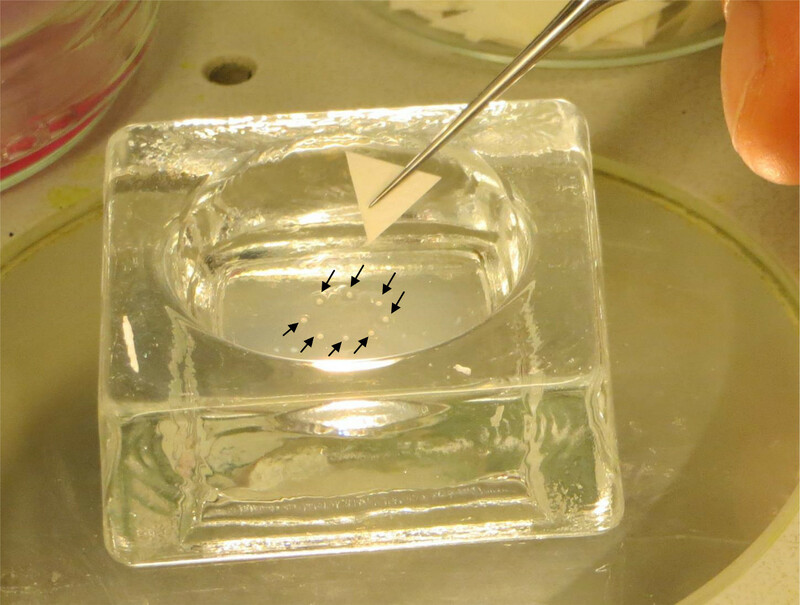 Eight PHFs are placed on semi-solid agar in an embryological watch glass, and fluid excess is removed with a small triangular piece op filter paper. Arrows indicate the 8 individual PHFs. Please click here to view a larger version of this figure. Bring ten selected spheroidal cell aggregates (diameter = 0.2 mm) into the circle using a Pasteur pipet. Aspirate excess medium. Move one aggregate towards each of the PHF with the needle until they make contact with each other. Aspirate excess medium using a small piece of filter paper. Seal the lid of the watch-glass with paraffin, and incubate at 37 °C for 4 - 24 h, depending on the adhesive properties of the test cells to the PHFs. Immerse the confronting pairs with pre-warmed (37 °C) culture medium, and transfer each individual pair with a Pasteur pipet into a 5 ml Erlenmeyer flask containing 1.5 ml of culture medium. Incubate the flasks on a gyrotory shaker at 37 °C adjusted to 120 rpm. 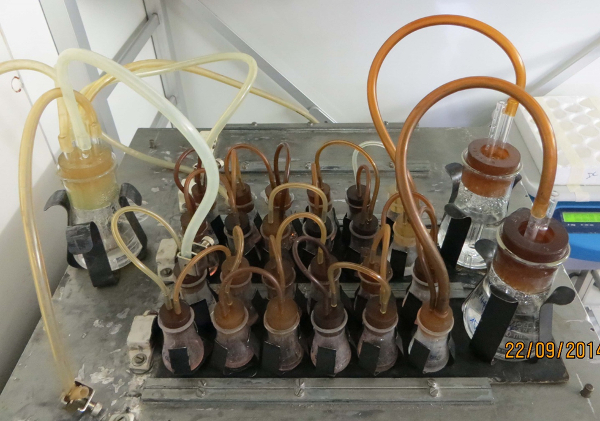 Gas the flasks with 5% or 10% (v/v) CO2 in air, depending on the type of culture medium used for the test cells (see Figure 4). To avoid concentration of the media, moisten the gasses by passing them through two supplementary 5 ml Erlenmeyer flasks filled with 2 ml of Ringer’s salt solution. Refresh the culture medium every 8 days. Figure 4. Small Erlenmeyer flasks on top of a gyrotory shaker. The flasks with 1.5 ml of culture medium are sealed with silicone stoppers equipped with a gas in - and outlet needle, and moved at 120 rpm at 37 °C. The gas is led by an inlet tubing (1) to the larger Erlenmeyer flask (2) filled with sterile Ringer’s salt solution, and further distributed (3 and 4) to smaller flasks containing culture medium with individual confronting pairs (5 and 6). Finally, spent gas is collected in a larger flask with a sterile water trap (7), from where it can escape into the air (8). The figure shows two sets of culture batteries on top of a home-made platform plate. Please click here to view a larger version of this figure. Dissolve 2.5 g of cupric acetate (neutral) in 100 ml of single-distilled water and slowly add 4.0 g of picric acid. Filter the solution through a paper filter. Add 10 ml of formalin and 1 ml of acetic acid. Mix 9 parts of this solution with 1 part of a saturated mercuric chloride solution in single-distilled water. CAUTION: This solution contains several toxic substances. Formalin is toxic by inhalation, in contact with skin, and if swallowed. Acetic acid is corrosive for mouth and intestinal tract after ingestion. Picric acid is allergenic and explosive when rapidly heated or by percussion. Mercuric chloride is highly corrosive to mucous membranes and nefrotoxic. Wear protective clothing and gloves for preparing Bouin-Hollande’s solution, and handle it in a well ventilated area remote from fire. An alternative fixation procedure is based on 4% formaldehyde in phosphate-buffered saline. Fix the individual cultures after several days or weeks of incubation as follows. First, transfer the cultures to Ringer’s salt solution for a few seconds to remove serum proteins. Next, immerse in Petri dishes with a diameter of 3 cm containing 3 ml Bouin-Hollande’s fixation solution for approximately 2 h.
Rinse the cultures three times in 3 ml demineralized water before incubating them in water for 2 h to remove as much fixation solution as possible. Finally, transfer to 3 ml of 70% (v/v) ethanol in water. Keep the cultures in this solution O/N, but this can be extended for a number of days. Dehydrate by transferring sequentially through jars containing 100 ml of 96% (v/v) ethanol in water, 100% ethanol or 100% isopropanol, and 100% xylene for 2 hr each. Transfer each culture to a separate glass coverslip (with a minimal amount of xylene), place the coverslip on the bottom of a wine bottle capsule for paraffin embedding, and cover the fixed material with liquid paraffin wax at 56 °C. Incubate at 56 °C for 24 h, and then cool the embedded material to RT. CAUTION: As a benzene derivative xylene may be toxic after inhalation and should be handled in well ventilated areas only. Remove the wine bottle capsule and the coverslip, and cut out the paraffin block which contains the fixed culture. Make 8 µm thick paraffin sections of the entire confronting pair using a microtome14, and collect all sections on three alternating microscope glass slides that have been pretreated with tissue adhesive solution as a sticking agent. Avoid egg white as a sticking agent, because it may interfere with immunostaining. Note: Pretreatment of the microscope glass slides is done by delivering 1 small drop of tissue adhesive solution and 3 small drops of demineralized water with a Pasteur pipet, and mixing them to cover the slide. Remove the paraffin from the first slide by immersing twice in a jar containing 100 ml 100% xylene for 10 min. Rehydrate the slides by immersion for 10 s in jars containing 100 ml of the following solutions: xylene/ethanol (1:1), 100% ethanol, 96% (v/v) ethanol in water, 70% (v/v) ethanol in water, and finally demineralized water. Dissolve mercuric chloride crystals by immersion in a jar containing 100 ml of 0.5% (w/v) Iodine in 96% (v/v) ethanol in water for 2 min. Clear the sections in a jar containing 100 ml of 5% (w/v) sodium thiosulfate in water for 10 sec. Then wash the slides thoroughly in distilled water. Incubate the slides in a jar containing 100 ml Harris’ hematoxylin for 2 min, submerge briefly in 0.1 M HCl, and then wash in running tap water for 10 min. Incubate in a jar containing 100 ml eosin 0.1% (w/v) in water for 1 min. 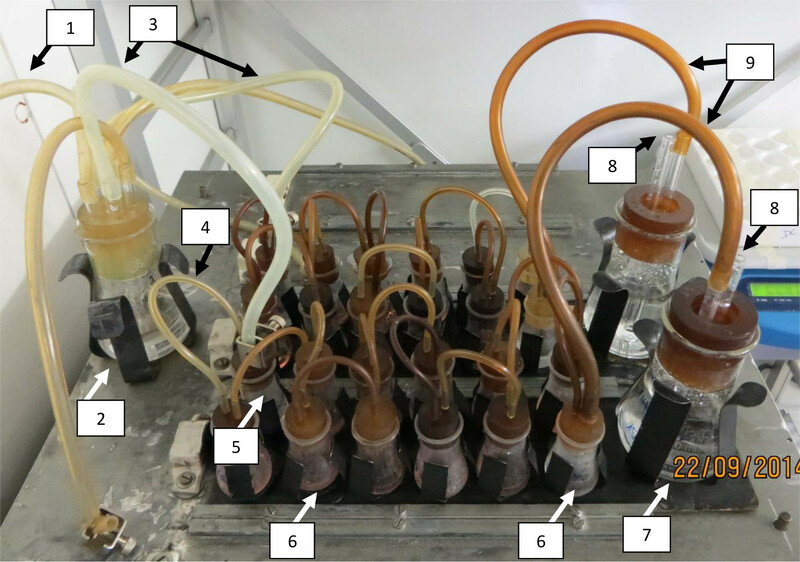 Dehydrate via brief submersion in jars containing 100 ml of the following series of solutions: demineralized water, 70% (v/v) ethanol, 96% (v/v) ethanol, 100% ethanol twice, xylene–ethanol (1:1), and finally in 100% xylene. Mount the slides with mounting medium by delivering 2 separate drops of the medium on the slides, let these expand by putting a coverslip on top of them, and let it harden at RT for 24 h.
Prepare Tris-buffered saline (TBS). Dissolve 6.0 g of tris-(hydroxymethyl)-aminomethane (Tris base) and 45.0 g of NaCl in 4.5 L of demineralized water. Bring to pH 7.6 with 1 M HCl (about 42 ml). Add distilled water to make 5 L.
Prepare Tris-HCl buffer. Dissolve 60 g of Tris base in 800 ml of demineralized water. Bring to pH 7.6 with 6 M HCl (about 65 ml). Add distilled water to make 1 L. Dilute 10x with distilled water before use. Prepare Tris-BSA 0.1% buffer. Dissolve 12.1 g of Tris base and 45.0 g of NaCl in 4.5 L of demineralized water. Bring to pH 8.2 with 1 M HCl (about 42 ml). Add 5.0 g of bovine serum albumin (BSA) and 6.5 g of NaN3. Add demineralized water to make 5 L.
CAUTION: NaN3 is a highly toxic product. Contact with acids liberates very toxic gasses. Wear gloves and avoid ingestion by all means. NaN3 forms very sensitive explosive compounds with copper, lead and other metals. Flush sinks with copious amounts of water. An alternative preservative is 0.01% thiomersal. Follow items 3.2 to 3.10. Dip the slides in TBS or Tris–0.1% BSA buffer, and wipe off excess fluid around the sections using a paper towel. Apply 150 µl normal goat serum diluted 1:20 in TBS or in 5% (w/v) BSA in Tris–0.1% (w/v) BSA buffer for 30 min in a high-humidity chamber (a closed box for the co-incubation of the slides with an open water recipient ensuring high humidity inside). Then remove excess fluid with a paper towel. Apply 150 µl primary antiserum diluted in Tris–0.1% (w/v) BSA supplemented with 1% (v/v) normal goat serum for at least 2 hr in a high-humidity chamber. Determine the optimal dilution of the primary antiserum empirically. Note: Immunohistochemistry can be used to detect chick heart antigens but, using specific antibodies, the technique described for chick heart antigens can be applied to other antigens (such as green fluorescent protein)15 as well. Wash the slides twice in Tris–0.1% w/v BSA on a rocking table for 5–10 min. Remove excess fluid using a paper towel and apply 150 µl goat anti-rabbit antiserum in excess (e.g., 1:20 in TBS) for at least 1 hr in a high-humidity chamber. Wash twice with TBS on a rocking table for 5–10 min. Remove excess fluid using a paper towel. Apply the peroxidase–anti-peroxidase complex diluted 1:250 in TBS supplemented with 1% (v/v) normal goat serum for at least 1 hr in a high humidity chamber. The dilution of the complex depends on the batch. Wash the slides with TBS and transfer to Tris–HCl buffer pH 7.6. Transfer the slides into a Tris–HCl buffer containing 0.25 g/L of diaminobenzidine and 0.01% (v/v) H2O2 for a few minutes. Stop the incubation when the chick heart is stained. Check regularly under the microscope. Transfer the slides to Tris–HCl for 10 min and then to distilled water. Follow items 3.13 and 3.14. Wash the living cultures with 3 ml of Ringer’s salt solution to remove serum proteins. Add one drop of embedding medium to the precooled (−16 °C) specimen holder of a cryomicrotome. 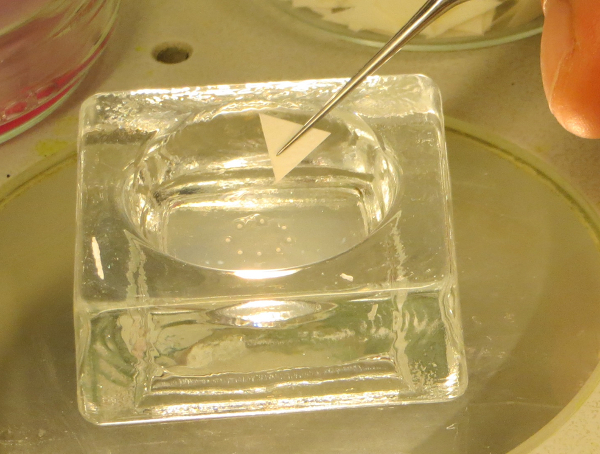 Transfer the cultured tissue from the edge of a glass coverslip to the top of this drop before it is completely frozen. Cool the culture to −16 °C, cut 6 µm thick frozen sections, and collect them on gelatin-coated glass slides. Fix the slides in acetone at 4 °C for 10 min before storage at 4 °C. Follow items 4.5 to 4.15. Note: In the present assay, invasion is defined as the progressive occupation of the PHF by the confronting test cells. Microscopic analysis of all consecutive sections from a confronting culture allows the reconstruction of the interaction between the test cell aggregates and the PHFs in three dimensions. Observe the different patterns of interaction and grade according to the following scale (see Figure 5). Grade 0: Only PHF observed. No confronting cells can be observed. Grade I: The confronting test cells are attached to the PHF, but do not occupy the heart tissue, not even the outermost fibroblastic cell layers. Grade IIa: Occupation of the PHF is limited to the outer fibroblast-like and myoblast cell layers. Grade IIb: The PHF has surrounded the cell aggregates but there are no signs of occupation. Grade III: The confronting cells have occupied the PHF, but have left more than half of the original amount of heart tissue intact. Grade IV: The confronting cells have occupied more than half of the original volume of the PHF. Note: Grades I and II are observed with noninvasive cell populations, while grades III and IV are typical of invasion. To evaluate progression within different time frames, histological analysis should be applied to confronting cultures fixed after different incubation periods. Figure 5. Examples of interactions between confronting cancer cells and PHFs. Histological sections of confronting cultures stained either with hematoxylin-eosin (left panels) or immunohistochemically with an antibody against chick heart (right panels). Interaction grades are defined in the protocol text. (H: heart tissue, T: tumor cells). Please click here to view a larger version of this figure. Transfer the confronting cultures in a minimal volume to 24-well tissue culture multidishes with a Pasteur pipet. Wash the cultures by adding 500 µl of drug-free culture medium, and refresh after 6 hr. Inspect all wells daily for cell outgrowth from the explants using an inverted microscope (objective lens 40X). Divide the number of outgrowing cultures by the total number of explanted cultures to obtain an index of survival of the confronting cultures. Compare the results of drug-treated cultures with solvent-treated ones. Note: The use of Ki67 immunohistochemistry (for cell proliferation) and of TUNEL assay (for apoptosis) are suggested as complementary techniques to the explant assay for assessing toxicity. Measure in mm the larger ( a) and smaller ( b) diameter of the culture taking into account the magnification. Calculate the growth of the culture by comparing this final volume with the combined volumes of PHF and cell aggregate at the start of the confrontation. Note: Because solitary PHFs tend to decrease their volume during culture, growth of the confronting pairs is dependent on the tumor cells. The histological sections as presented in Figure 5 show the end result of a number of successful assays. The sound histology of the cultures indicates viable cells and allows to interpret the interaction between tumor cells and normal tissue. Furthermore, no immune reaction from the normal tissue can be observed, which confirms the correct age of the chick embryos used e.g., before the immune rejection system is developed. There are no bacteria visible, which indicates absence of (gross) contamination during the culture period. Finally the rounded periphery of the sections confirms culture in suspension without signs of (temporary) adherence to the Erlenmeyer flask wall. Many compounds have been tested in the assay. Drugs are generally delivered to the culture medium at the moment when the confronting PHF/tumor aggregate pairs are transferred to small Erlenmeyer flasks (step 2.7). Some were used as tools (known inhibitors and activators) to unravel pathways and effector molecules implicated in the process of tumor invasion. For other compounds which were structurally related, a quantitative structure-activity relationship (QSAR) was established based on the results of the chick heart invasion assay. So, for related polyphenolics a number of computational descriptors were used to enable the prediction of their anti-invasive activity in the assay. Over a period of 15 years 139 different analogs were tested for their possible anti-invasive effects in the assay, and their activities were grouped into 4 classes. A training and a validation set consisting of 93 and 46 of those polyphenolics respectively were randomly selected. By means of a QSAR artificial neural network the results of the validation set showed a clear correlation between the predicted and experimental anti-invasive activities17 (see Figure 6). The data show the robustness of the chick heart invasion assay, since the correlation between predicted and experimental results was valid over 15 years, and confirmed in a recent (unpublished) prediction study with different polyphenolics. The confusion matrix presented in Figure 6 summarizes the weakness and the strength of the assay graphically: it gives a rough expression of the accuracy and the reproducibility. The interpretation of this graph should take into account the biological variability of living organ cultures, and the semi quantitative score of the invasion results. Figure 6. External validation of a predictive QSAR model (artificial neural network) for the activity of small molecules in the chick heart invasion assay. The output of this model is the anti-invasive activity class of a compound. Four such classes have been defined, representing the lowest concentration at which a molecule exerts anti-invasive activity (i.e., invasion grade I or II) in the CHI assay: class 4 (active down to 1 µM), class 3 (10 µM), class 2 (100 µM) and class 1 (no anti-invasive activity at concentrations as high as 100 µM). 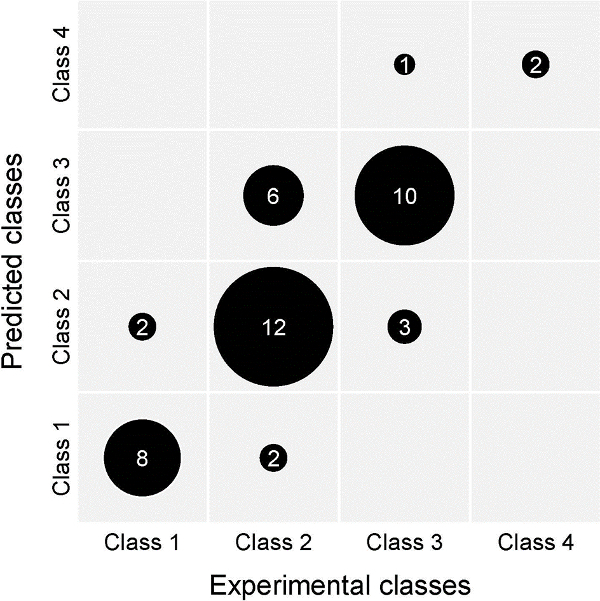 The depicted confusion matrix compares predicted and experimentally determined anti-invasive activity classes for the compounds of the validation set. The validation set contains 46 compounds, the training set 93. Model predictions are based solely on descriptors calculated from molecular structure, and can thus be obtained for hypothetical compounds. This way, synthetic efforts can be focused on molecules with promising in silico activity. Please click here to view a larger version of this figure. During the preparation of PHFs, the fragments may not stay in suspension but adhere to the vessel wall; this can be overcome by increasing the volume of the culture medium. If the number of PHFs is too low and their size is too big, decrease the volume of the culture medium. Failure of the test cells to aggregate may be due to fluctuations in the temperature or to microbial infection. Alternatively, an inability to aggregate may be an intrinsic characteristic of the cells. During attachment of the aggregates to PHF, poor adhesion may be overcome by extending the incubation period on top of the semisolid agar medium or by removing more fluid culture medium around the cultures by means of absorbing filter paper. Check also for microbial contamination in this case. Difficulties during sectioning may be due to disintegration of the paraffin blocks: this occurs when the storage period of the blocks has been too long (melt the paraffin once again). When sectioning artifacts occur, the integrity of the microtome knife and the absence of corpora aliena in the fixed cultures should be checked. Necrotic areas in the cultures are signs of poor culture conditions. If these areas are restricted to the center of the cultures, one should suspect the volume of the confrontations being too large. Proper selection of the volumes of the PHF and cell aggregates is indeed a critical factor. However, more generalized necrosis points towards inappropriate pH control, microbial contamination or fixation artifacts. Finally, when the sections appear too dark, the immersion period in hematoxylin may be too long, or the sections may be too thick (>8 µm). Many variations on the chick heart assay have been applied successfully in invasion studies. These variations relate to the origin of the host tissue, the presentation of the confronting test cells, and the incubation conditions. Heart fragments from species other than chick18, and from tissues such as liver19, lung20, and brain21, have been examined. Instead of aggregates, biopsy specimens22monolayer fragments23, and cell suspensions have been used to confront with PHF in organ culture. Suspension cultures are sometimes replaced by static cultures on top of a semisolid substrate24, and serum-free confrontations have been shown to be feasible with certain types of cells25. Generally, the interaction is described in accordance with a semi quantitative scale26 however, computer-assisted automated image analysis systems have also been developed27,28. The latter aim to provide quantitative information on the extent of tumor cell invasion. As the chick heart assay includes a living host tissue, the setup attempts to recapitulate the situation in vivo, and clearly is of some relevance compared with other systems in vitro (see introduction section). It should, however, be recognized that the assay fails to encompass all the elements of the microecosystem present in natural tumors, environments where for example immunological factors can influence the invasive behavior of the cancer cells. In at least one study, the absence of such factors in the assay has led to conflicting results between the outcomes of the chick heart assay29 and those of an animal model30. A future application will be the study of cardiomyocyte progenitor cells in the assay. These cells can be injected therapeutically into infarction zones of cardiac patients, but they should be able to integrate into the myocardium. 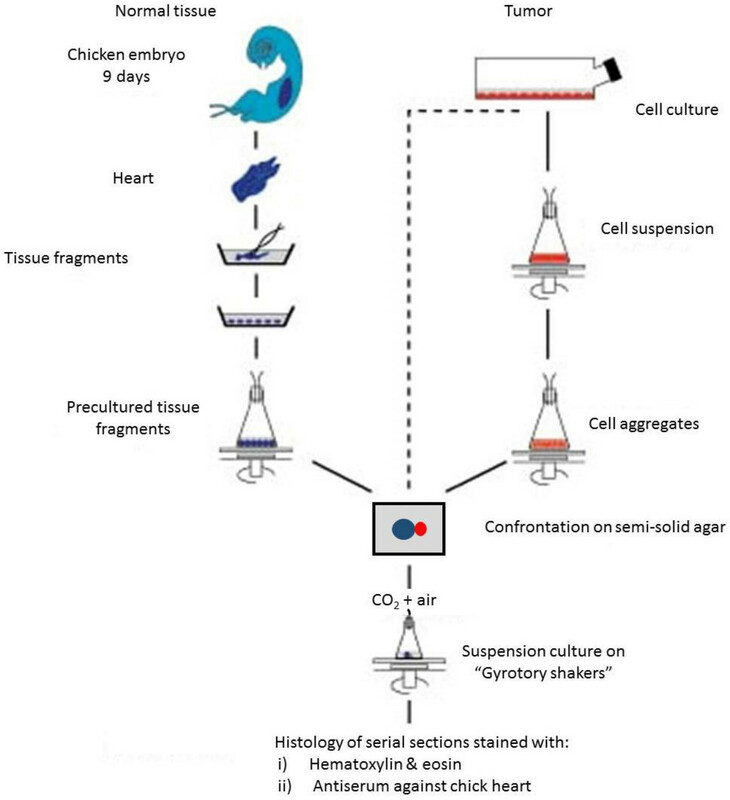 In the chick heart assay the progenitor cells will be confronted with chick heart fragments, and their migration and differentiation will be analysed. We thank Marleen De Meulemeester for demonstrating the assay technique in the video film. B. I. R. is a Postdoctoral Research Fellow of the Research Foundation – Flanders (FWO – Vlaanderen). L.M.M. is a recipient of an Emmanuel van der Schueren grant from the Flemish League against Cancer (Vlaamse Liga tegen Kanker). Mareel, M. M., Bracke, M. E., Van Roy, F. M., de Baetselier, P. Molecular mechanisms of cancer invasion. Encyclopedia of Cancer. JR, B. ertino 2, Academic Press. San Diego. 1072-1083 (1997). Mareel, M., Kint, J., Meyvisch, C. Methods of study of the invasion of malignant C3H mouse fibroblasts into embryonic chick heart in vitro. Virchows Arch. B. Cell Pathol. Incl. Mol. Pathol. 30, (1), 95-111 (1979). Albini, A., Noonan, D. M. The ‘chemoinvasion’ assay, 25 years and still going strong: the use of reconstituted basement membranes to study cell invasion and angiogenesis. Curr. Opin. Cell Biol. 22, (5), 677-689 (2010). De Wever, O., et al. Single cell and spheroid collagen type I invasion assay. Methods Mol. Biol. 1070, 12-35 (2014). Wolff, E., Schneider, N. La transplantation prolongée d’un sarcome de souris sur des organes embryonnaires de poulet cultivés in vitro. C.R. Seances Soc. Biol. Fil. 151, (7), 1291-1292 (1957). Easty, G. C., Easty, D. M. An organ culture system for the examination of tumor invasion. Nature. 199, 1104-1105 (1963). Schleich, A. B., Frick, M., Mayer, A. Patterns of invasive growth in vitro. Human decidua graviditatis confronted with established human cell lines and primary human explants. J. Natl. Cancer Inst. 56, (2), 221-237 (1976). Sys, G. M. L., et al. The In ovo CAM-assay as a Xenograftodel for Sarcoma. J. Vis. Exp. (77), e50522 (2013). Bracke, M. E., Van Larebeke, N. A., Vyncke, B. M., Mareel, M. M. Retinoic acid modulates both invasion and plasma membrane ruffling of MCF-7 human mammary carcinoma cells in vitro. Br. J. Cancer. 63, (6), 867-872 (1991). Vermeulen, S. J., et al. Transition from the noninvasive to the invasive phenotype and loss of alpha-catenin in human colon cancer cells. Cancer Res. 55, (20), 4722-4728 (1995). Parmar, V. S., et al. Anti-invasive activity of 3,7-dimethoxyflavone in vitro. J. Pharma. Sci. 83, (9), 1217-1221 (1994). Parmar, V. S., et al. Anti-invasive activity of alkaloids and polyphenolics in vitro. Bioorg. Med. Chem. 5, (8), 1609-1619 (1997). Gaillard, P. J. Organ culture technique using embryologic watch glasses. Methods in Medical Research. MB, V. isser 2, Year Book Publishers. Chicago. 241-24 (1951). Romeis, B. Das mikrotom. Mikroskopische Technik. 15 Verb. Aufl. Kapitel. 7, München: Leibniz. 114-120 (1948). Van Marck, V., et al. P-cadherin promotes cell-cell adhesion and counteracts invasion in human melanoma. Cancer Res. 65, (19), 8774-8783 (2005). Attia, M. A., Weiss, D. W. Immunology of spontaneous mammary carcinomas in mice. V. Acquired tumor resistance and enhancement in strain A mice infected with mammary tumor virus. Cancer Res. 26, (8), 1787-1800 (1966). Katritzky, A. R., et al. QSAR modeling of anti-invasive activity of organic compounds using structural descriptors. Bioorg. Med. Chem. 14, (20), 6933-6939 (2006). McKinnell, R. G., Bruyneel, E. A., Mareel, M. M., Seppanen, E. D., Mekala, P. R. Invasion in vitro by explants of Lucke renal carcinoma cocultered with normal tissue is temperature dependent. Clin. Exp. Metastasis. 4, (4), 237-243 (1986). Wanson, J. C., de Ridder, L., Mosselmans, R. Invasion of hyperplastic nodule cells from diethylnitrosamine treated cells. Cancer Res. 41, (12 Pt 1), 5162-5175 (1981). Mareel, M. M., et al. Effect of temperature on invasion of MO4 mouse fibrosarcoma cells in organ culture. Clin. Exp. Metastasis. 2, (2), 107-125 (1984). Laerum, O. D., Steinsvag, S., Bjerkvig, R. Cell and tissue culture of the central nervous system: recent developments and current applications. Acta Neurol. Scand. 72, (6), 529-549 (1985). Schroyens, W., Mareel, M. M., Dragonetti, C. In vitro invasiveness of human bladder cancer from cell lines and biopsy specimens. Clin. Exp. Metastasis. 1, (2), 153-162 (1983). Mareel, M. M., De Bruyne, G. K., Vandesande, F., Dragonetti, C. Immunohistochemical study of embryonic chick heart invaded by malignant cells in three dimensional culture. Invasion Metastasis. 1, (3), 195-204 (1981). Bjerkvig, R., Laerum, O. D., Mella, O. Glioma cell interactions with fetal rat brain aggregates in vitro and with brain tissue in vivo. Cancer Res. 46, (8), 4071-4079 (1986). Bracke, M. E., et al. Confrontation of an invasive (MO4) and a non-invasive (MDCK) cell line with embryonic chick heart fragments in serum-free culture media. In Vitro Cell Dev. Biol. 22, (9), 508-514 (1986). Mareel, M. M., Bracke, M. E., Storme, G. A. Mechanisms of tumor spread: a brief overview. Cancer Campaign. 9: The Cancer Patient. Grundmann, E. Gustav Fisher Verlag. Stuttgart and New York. 59-64 (1985). De Neve, W. J., Storme, G. A., De Bruyne, G. K., Mareel, M. M. An image analysis system for the quantification of invasion in vitro. Clin. Exp. Metast. 3, (2), 87-101 (1985). Smolle, J., et al. Quantitative evaluation of melanoma cell invasion in three-dimensional confrontation cultures in vitro using automated image analysis. J. Invest. Dermatol. 94, (1), 114-119 (1990). Bracke, M. E., et al. flavonoid effect on tumor invasion and metastasis. Food Technol. 48, (11), 121-124 (1994). Bracke, M. E., et al. The influence of tangeretin on tamoxifen’s therapeutic benefit in mammary cancer. J. Natl. Cancer Inst. 91, (4), 354-359 (1999).